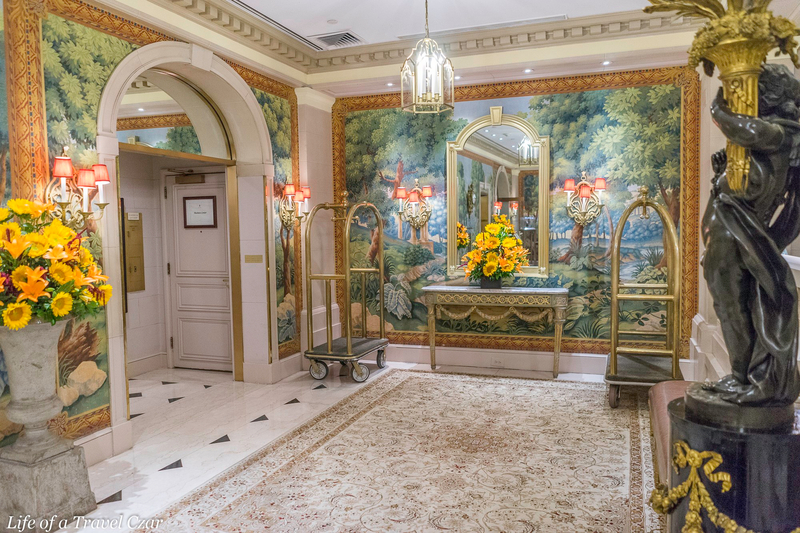 The Hôtel Plaza Athénée is located just off Madison avenue near Central Park. It’s one of the more quieter streets in Manhattan (if there’s such a thing). There isn’t a giant external logo or hotel sign synonymous with the major hotel chains– it’s quite nondescript and the street is lined with beautiful trees. The check in area is quite minimalist and just has an antique French desk and a couple of chairs. The issue at check-in was that my room took ages to be ready, but eventually the manager notifies me that he’s managed to secure a good room for me. Thankfully I had a shower onboard my flight which meant I was all fresh and able to explore the city before the room was ready. 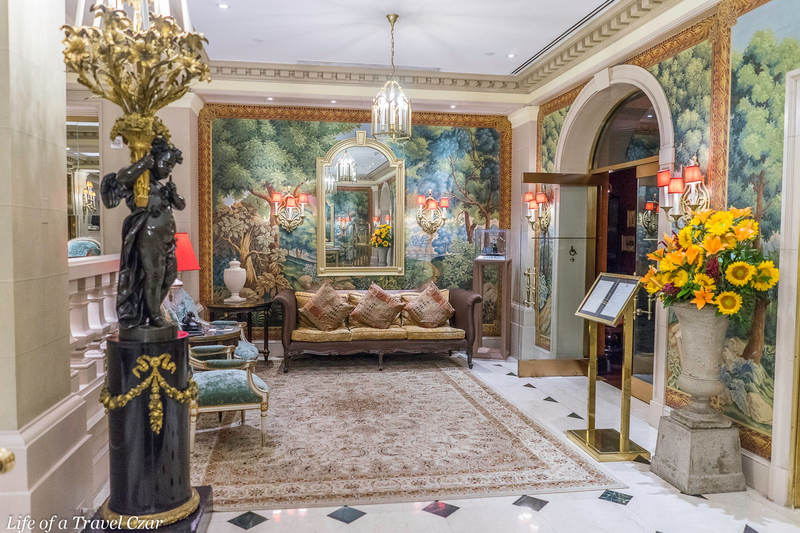 The broader lobby mixes the paradox of French grandeur with understatedness. 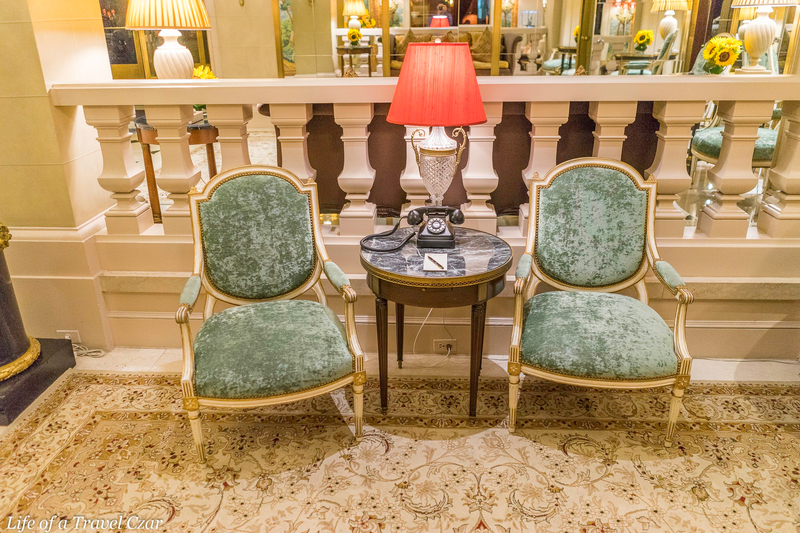 There are beautiful green Louis XV chairs, rugs, sculptured lighting and floral wall prints. As you walk through there are large granite urns with colourful floral arrangements next to the elevators. 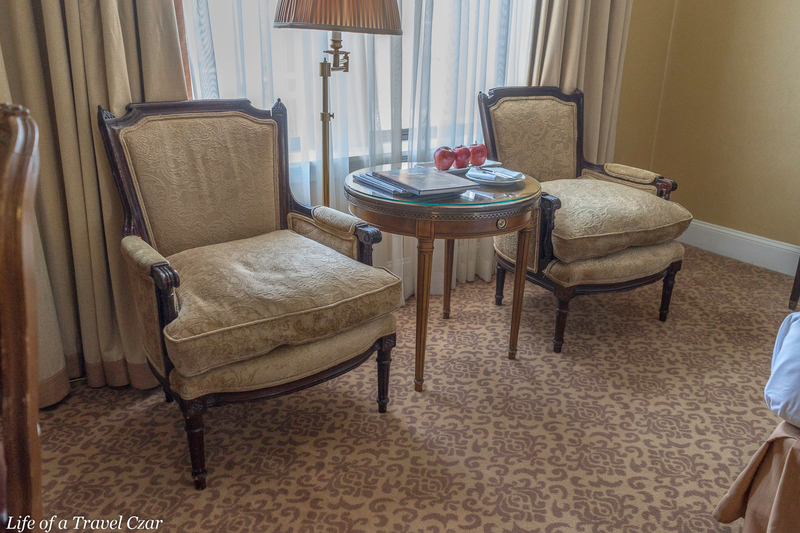 The guest rooms have an elegant romantic French feel; beautiful linens, light brown carpets and plush comfortable sofas, a decent mini-bar and an elegant work desk. 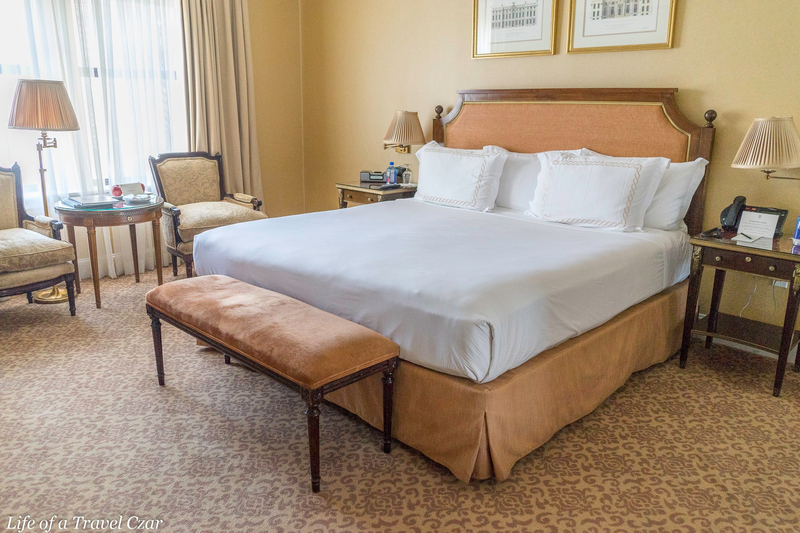 The bed proves super comfy and the room has all the necessary amenities for a comfortable stay. You can check it out the video diary at the end of the post which provides a full room tour. The hotel does a twice daily maid service; this is more than a turn-down service as the room is cleaned twice; beds are made, blinds opened (morning service) / closed (evening service), bath products replenished and little tidy-ups as needed. 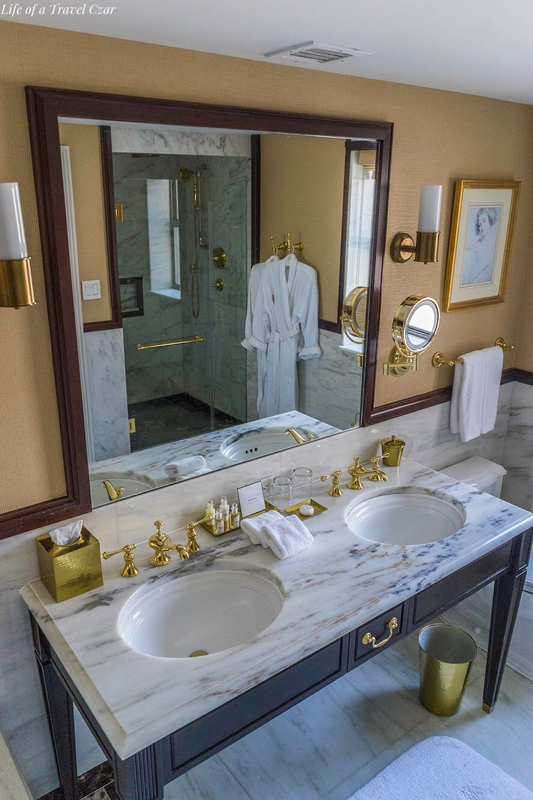 Where the room really shines is the marble bathroom. It’s rare to have bathrooms with this style of marble and the level of marble coverage is just so amazing! The taps are gold plated and so are the shower taps and shower head. 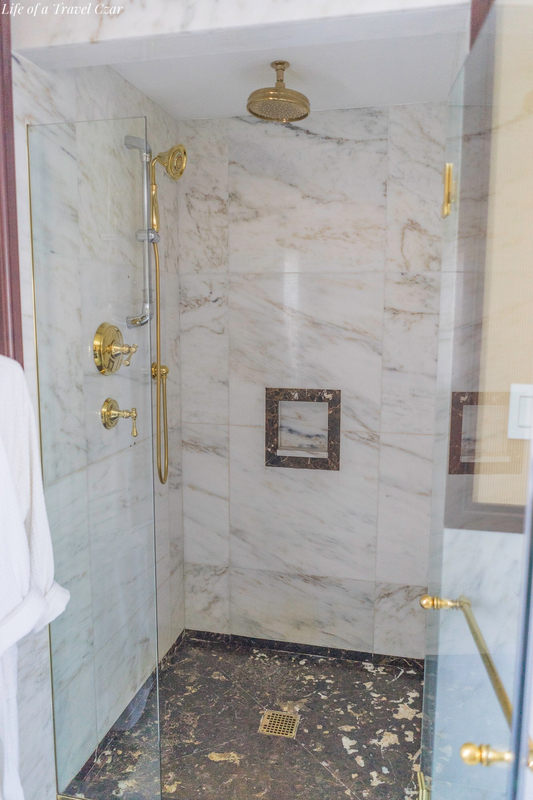 There is both a deep soaking marble bath and rainforest shower. The bathrobes are oh so plush and some of the most comfortable ones I’ve worn. There’s such a sense of luxury you get the moment you step inside. I love it so much, I actually feel like laying the bath towels on the floor and sleeping in the bathroom. 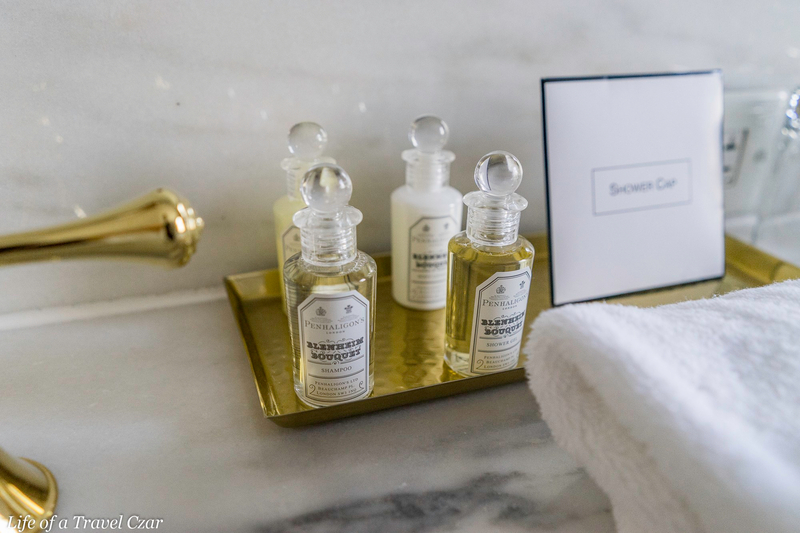 Luxe bath amenities from Penhaligons (UK) are provided, these have royal warrants by (are used by) both the Duke of Edinburgh and Prince of Wales. 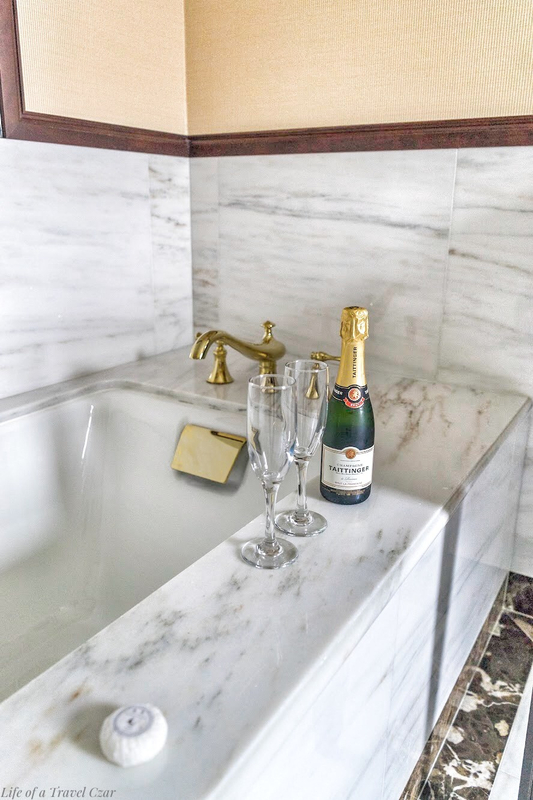 The perfect tonic before bed is opening a freshly chilled bottle of champagne and sipping on it the deep soaking tub. Where this hotel really outshines other hotels is the breakfast. Most hotels have automated (to a machine-like standard) the hotel breakfast. I mean these systems are so assembly line like that Henry Ford would’ve been impressed. This has caused me to retreat to my room and seek solace from the in-room dining menu for most of my breakfasts. There is nothing more disheartening that the lack civility and absence of tranquility of the big buffet dining rooms where stale eggs, hams and other mass-produced breakfast items are served. 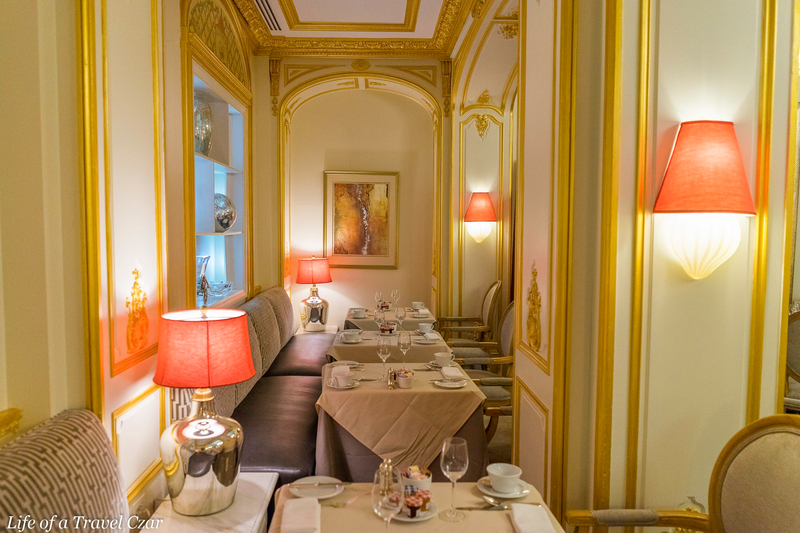 The Plaza Athenee takes a different approach; breakfast is served in the Arabelle restaurant. It’s a genteel affair; there are no uncovered tables, no self-serve cutlery and no bain maries of stale food. All tables are covered with beautiful light cream table linen and beautiful silver cutlery is laid out on the table. A selection of jams and preserves sit on a the plate next to the glowing silver salt & pepper shakers. Everything here is cooked to order from their a la carte menu. 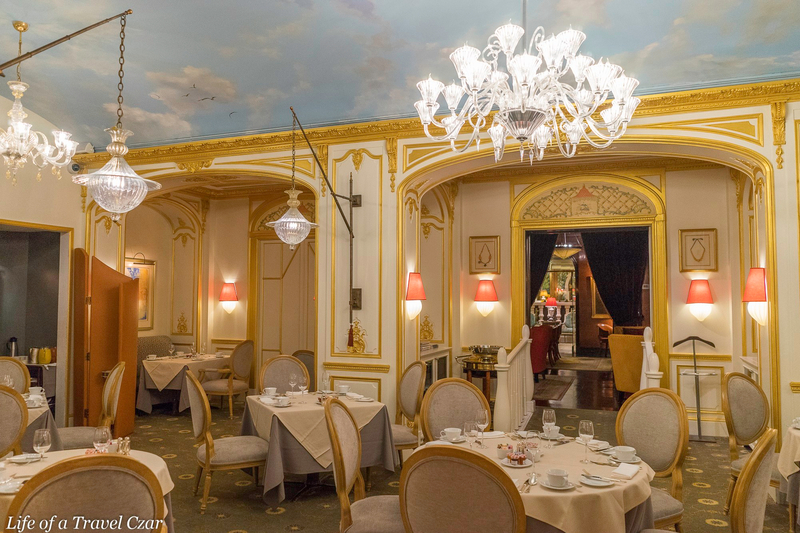 The restaurant setting itself is reminiscent of the grandeur of a European royal dining room; beautiful upholstered French chairs, cream walls, chandeliers and a sky painted ceiling with fluffy white clouds to match. 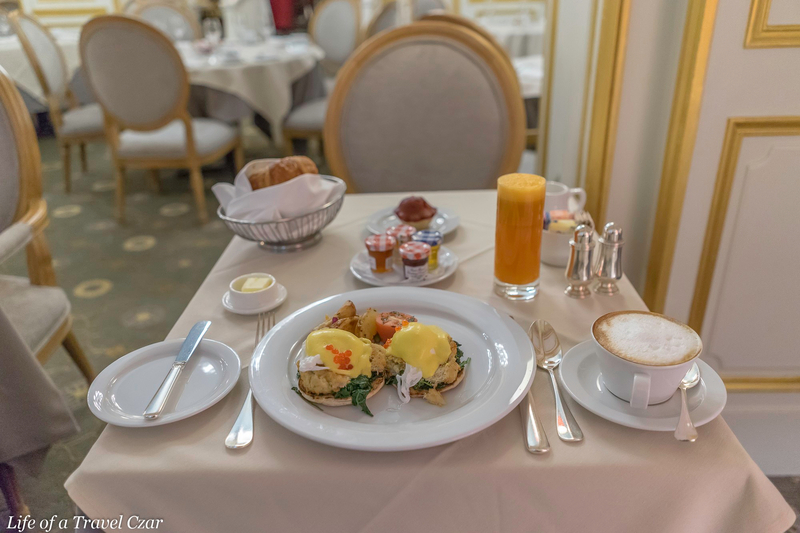 On the first morning, I order the Eggs Benedict Crab Cakes with caviar, an energizer juice, cappuccino and freshly baked croissants. The cappuccino is a delight (particularly a hard find in the US), the eggs benedict is a sublime experience with its creamy hollandaise, succulent crab meat, the burst of the salinity for the caviar, the beautiful toasted base and the runny gooey translucent yolk and light gelatine textured egg white. It’s a stunning display of textures and flavours. The energizer juice has some refreshing carrot with a bite of ginger and the fluffy and crispy coated croissants make a little flakey mess but are the epitome of a comfort breakfast. For a good measure a moist and rich red velvet cake is provided compliments of the chef. The next day I opt for a healthier breakfast of poached eggs, mushrooms, potatoes and asparagus. I request some salmon on the side which is not on the menu; but the chef obliges. Bar Seine which is at the entrance of Arabella is perfect for cocktails. 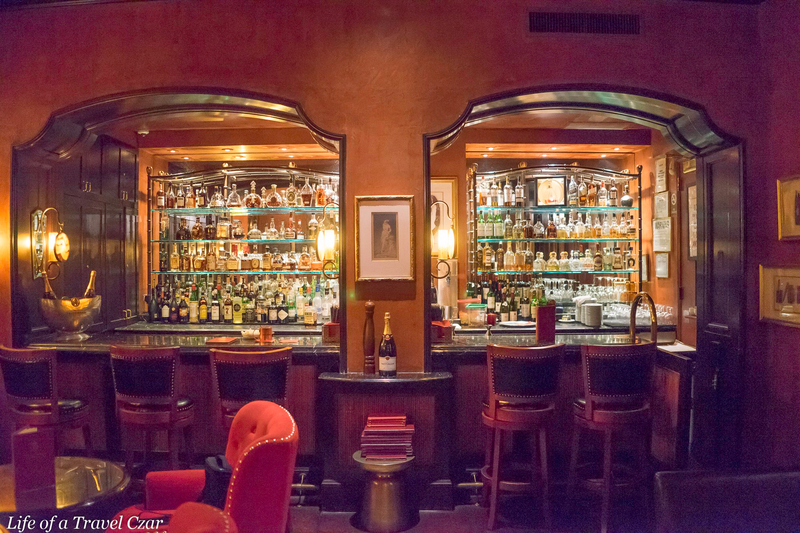 It has the mix of a colonial or old explorers club with lovely wooden bar front which has an extensive selection of liqueurs and wine on display. 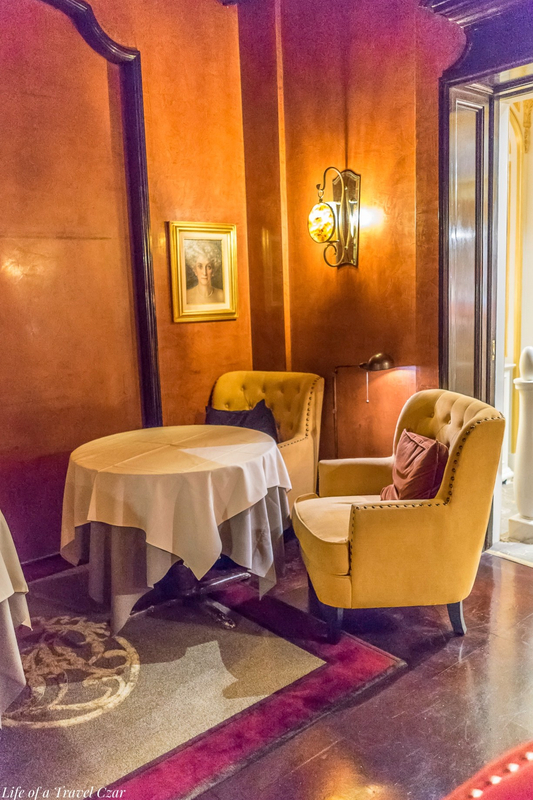 There are bar stools and beautiful plush lounge sofas and the walls are adorned with delightful paintings. I have a few cocktails here as I unwind after a long day (of doing nothing!). The hotel has a full-service Spa; Valmont which offers private spa treatments and steam showers and a well-equipped fitness centre. 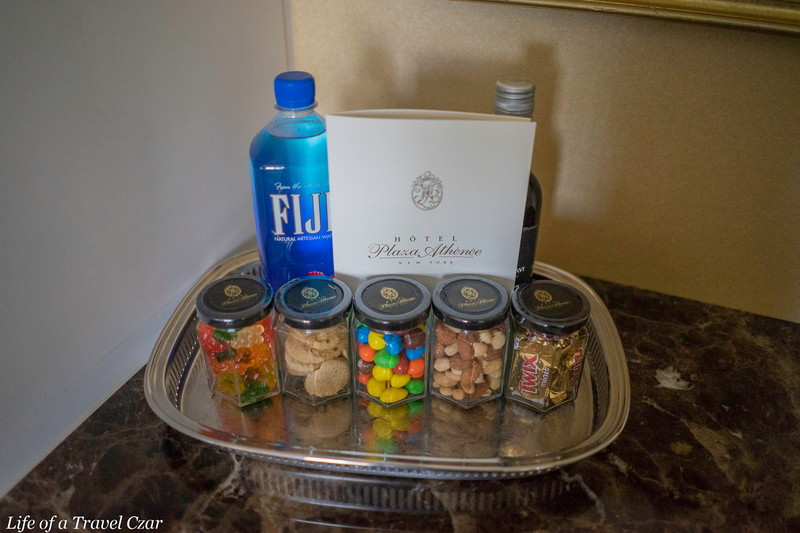 The concierge is amazing and from observing his handling of matters every day while I was chilling in the lobby, he can secure reservations to most restaurants and delivers when the guests need him. Here is a little video diary which conveys the grandeur of the hotel a bit better than the snaps. The location of the hotel is what does it; its central to mid-town, central park and most of New York’s key attractions. 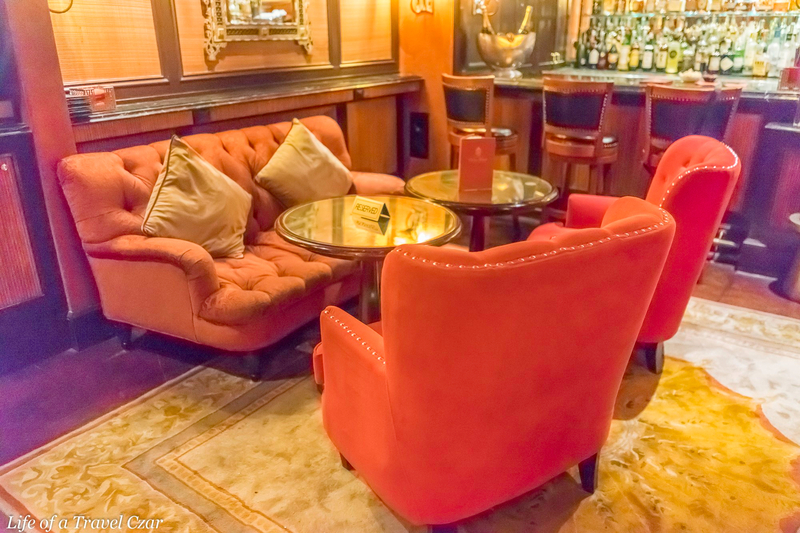 The hotel is boutique, but wonderfully decorated, has a welcoming bar to chill after a long night and the rooms were of a quality that’s on par with most of the major hotel chains. 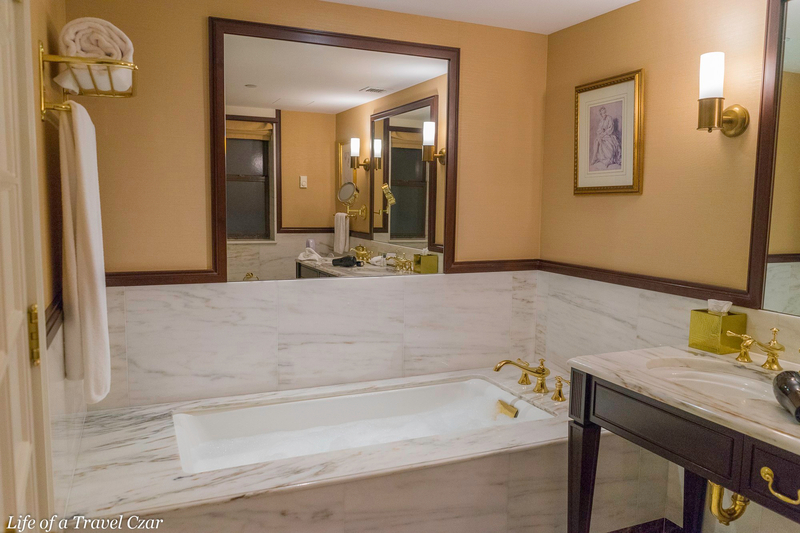 The marble bathroom was simply amazing; luxurious in every way. I loved staying here. The twice daily maid service is a lovely touch; I hate it when I comeback in the afternoon and have a nap and then the bed is left unmade until the next morning. 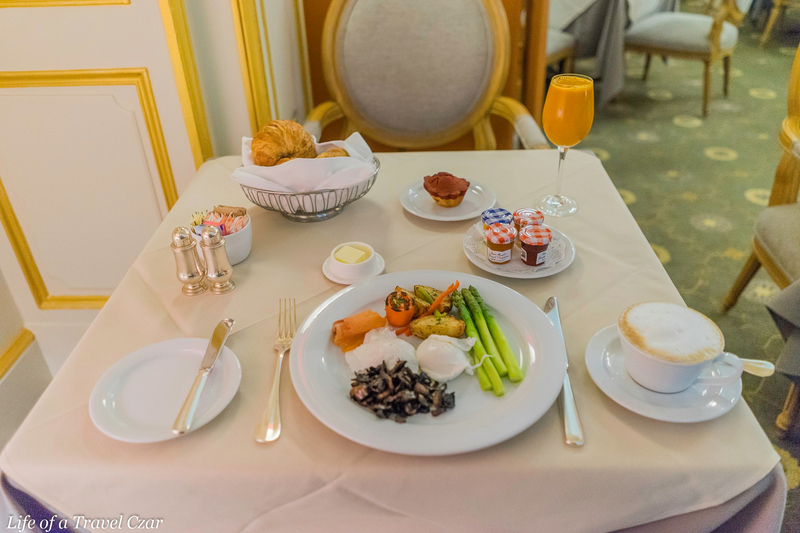 The breakfast at this hotel is just the best; say goodbye to the fast-paced buffet style breakfast of the major chains and enjoy a leisurely morning breakfast with attentive waiters, palatial surroundings and excellent cuisine. As it is a boutique hotel you don’t get the loyalty benefits of being a high tier member of a chain hotel. However, I booked this hotel using American Express Fine Hotels and Resorts Programme; which gave me complimentary breakfast for 2 people each night, a $100 credit for drinks at the bar, complimentary room upgrade and a 4pm check-out. The perfect way to spend my birthday weekend.